Serves 4. Preparation time 5 minutes. Cooking time 30 minutes. This typical American breakfast is not something you can prepare in a hurry. Take your time - the best part is the potato: crispy on the outside, soft on the inside. • Reheat the fat and add the potato. Shake the pan so the cubes are in a single layer. Let them turn golden brown before you flip them over. Sprinkle with 1/2 teaspoon salt, shaking the pan every now and then to prevent the potato from burning - it should take about 20 minutes. • In the meantime, in another pan, flatten the mince with an egg lifter and fry until cooked through and brown - the idea is to keep the mince chunky and not separate it with a fork as usual. • Move the mince to the side of the pan and fry the chives, mustard seeds and chilli flakes. 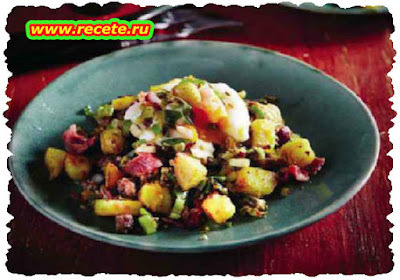 • When the potato cubes are browned and cooked, add the bacon and mince and stir the mixture until everything is hot. Work quickly to prevent the potato from losing its crispness. • Sprinkle fried chives and a dash of lemon juice over each portion and serve with fried eggs.